With just a few days until the NFL Honors award ceremony, the time has come to discuss who’s going to win. There has been a lot of debate over the MVP. Of course, Patrick Mahomes is the favorite, but will Drew Brees sneak in there, or maybe Aaron Donald? Personally, I think the bigger question is, who is going to win the Offensive Rookie of the Year? To me, it’s between Saquon Barkley and Baker Mayfield. But, in reality, it shouldn’t be that close. Look, Barkley had an unbelievable rookie season. He rushed for 1307 yards and 11 TDs with an average of 5.0 yards-per-attempt. He added 721 receiving yards on 91 receptions. That’s really cool, but what else did he do? Yes, he’s good at his position. But did he revive the Giants? Absolutely not! His team went 5-11 with arguably one of the best wide receivers in the game, an “elite” quarterback, and himself at the reins. Sure, it’s impressive how well Barkley when considering the mediocrity of the offensive line that he had to deal with, but to me, these awards should be about more than just performance as a rookie. They should be about how much the player has impacted the team since joining. 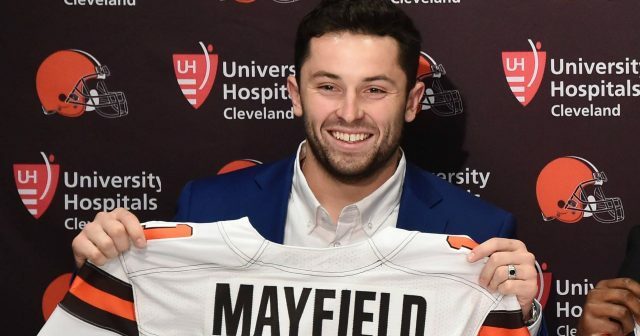 Mayfield has changed the culture of the Cleveland Browns organization since being drafted. There is a reason that John Dorsey drafted him first overall. He threw for 3725 yards with a completion percentage of 63.8. He threw 27 TDs with 14 interceptions, but six of those picks came before the head coaching change. He turned an 0-16 team to a 7-8-1 team. Had the coaching change come earlier, who knows what else could have happened. Mayfield has earned the respect of his teammates and has proven that he can be a stable and set quarterback for the Browns organization — something that it has not had for a long time. The Browns can now draft and build around him, and not scramble for a new quarterback every year. This is important in building a perennial playoff team years to come. Timing is also everything. With Lebron James leaving the Cavaliers in the offseason, Cleveland was looking for their new “big man.” Mayfield fulfills that role beautifully. He has brought the Browns fan base back to life by giving them belief in their football team. If you look at the stadium last season, there was barely anyone in the stands. Now? It’s packed. There’s a new life in Cleveland, and that life is Baker Mayfield. If you want to go by just stats, sure Saquon Barkley may be your go-to Offensive ROY candidate. But, if you are looking for someone who has ignited a dormant offense, changed the culture of a football team, and provided hope for a city, Baker Mayfield is your player.